Yuliya Tymoshenko's excellent showing in the parliamentary elections, which took many pundits by surprise, [but not us at foreignnotes ] has really given Yushchenko a problem of nightmare proportions. If Yushchenko's NSNU go with BYuT [and Socialists] into an orange coalition, they will be junior partner - Tymoshenko can now call herself undisputed leader of the Orange voters. If they go with PR they will be an even more junior partner; but much worse, this could well cause a split in NSNU, and trash any possibility of Yuschenko serving a second term as President - Tymoshenko possibly beating him to win the highest position in the land. NSNU as a party would probably be torn asunder and never recover. There are already reports of links and deals developing at regional level between some disgruntled members of NSNU, and BYuT. One of the reasons Tymoshenko did so well in last week's elections was that she received a large sympathy vote from orange supporters, many of whom felt that although Yushchenko owed her 'big-time,' he has treated her abominably on more than one occasion. During her spell as Deputy PM from 1999 to 2001 when Yushchenko was PM, as 'poacher-turned-gamekeeper' she was able to shut down many major fraudulent operations, particularly in the energy sector. The vast sums recovered meant that unpaid wages and pension arrears were paid on time at last. Yushchenko gained as much kudos for this as Tymoshenko, even though it was she that did a lot of the 'heavy lifting'. She was so successful that even some of President Kuchma's corrupt allies were being 'hurt', so he threw her into a filthy jail cell. Yushchenko did very little to help her out, as I recall. Fast forward to 2004. She gives up her aspirations to stand in the Presidential elections, and decides to support Yushchenko's campaign, both secretly agreeing that if he wins, she becomes PM. He is poisoned - at one stage in the Austrian clinic he tells his closest friends, 'Boys, I think I'm 'checking out..' [Khloptsi, meni kayuk..] thinking he is going to die. Yulia continues to lead the campaign on her own, and of course everyone knows of her electrifying performances in the 'Maidan'. Once elected, Yushchenko delays for weeks and does not announce who he will nominate as his PM, keeping her on tenterhooks until the last possible moment, even though he had signed a written understanding with Tymoshenko. Fast forward to early September 2005. Head of presidential secretariat Oleksandr Zinchenko resigns and 'blows the lid' on alleged continuing corruption in the President's administration and closest circle. He names big names - tellingly his press conference ends with a standing ovation by the journalists present. His revelations are supported by the resignation speech by Min of Culture Tomenko [now one of BYuT's top men] in which he also accuses the president's administration of hindering the solution of the Gongadze case. Both name the same chief 'corruptioneers' - Poroshenko, Tretyakov and Martynenko - all of whom have now been elected to the new Parliament. Yushchenko has a big problem. To deflect attention from himself he sacks Tymoshenko and the entire cabinet, as well as the named 'corruptioneers', and puts into place as stop-gap PM, Yuriy Yekhanurov, a grey 'technological' bureaucrat - a relic from Kuchma's era. Yushchenko's live TV dismissal of the PM and her cabinent left many Orange supporter totally shocked and dismayed, after the support Tymoshenko had given him during the Orange Revolution. "In June 2005, the Ukrainian Security Service (SBU) began a criminal investigation into RosUkrEnergo. This investigation was stopped, according to Oleksander Turchinov [Tymoshenko's oldest and most loyal confidant], then head of the SBU, on Ukrainian President Viktor Yushchenko's orders. One of the purported reasons the investigation ended was that there were grave suspicions by the SBU that former Ukrainian President Leonid Kuchma, Niyazov, and Russian President Vladimir Putin were all involved in substantial kickback schemes through RosUkrEnergo. Had these schemes been exposed, Ukraine stood to lose gas deliveries from both Russia and Turkmenistan. The other reason provided by Turchinov as to why the investigation was stopped was that some of Yushchenko's closest advisors were themselves now linked to RosUkrEnergo." After the brief 'gas war' with Russia early January this year, BYuT combines with other opposition parties in Parliament to bring down the Yekhanurov government for 'bungling' the unsound newly-negotiated Russian/Ukrainian gas deal. Grave suspicions still linger about shady intermediary companies who now monopolize the supply of gas to Ukraine. After all of this, can Yushchenko and NSNU really work again with Tymoshenko, now the undisputed leader of the Orange camp? But what's the alternative? Work with Yanukovych? - the man who urged Kuchma to use force to clear the orange protesters in the Maidan, and team up with the ' rogue's gallery of Ukrainian politics' that is the newly-elected PR deputy list? 'Vitya' Yushchenko is in deep doo-doo.. It just never goes away does it? This article says that Minsk will now pay market rates for its natural gas. They say it is an attempt to take over Belarus pipelines, but there is a nagging suspicion in the back of my head that this is also a way to set the stage for negotiations with Ukraine. "Everyone pays market rates." One analyst said that what is really driving this is Russia's lack of investment capital to modernize its gas industry. His point is that they are raising that capital but upping their rates. "No offense, its just business," would be this view. We saw that interview with Akhmetov yesterday and I turned to my wife and said, "He's trying too hard." What I meant was that he looked like he was trying real, real hard to appear likeable. He was almost giddy sitting there but a giddy layered over "wound up tight." Maybe it was the attempt of a controlled, close personality to appear personable but he overreached and it just came out giddy. His first statement was: "I am here to talk about soccer." It was a political interview and so that kind of out of the gates statement might have been funny, and he thought it was because he laughed at it, but it was rammed in. Maybe that's just his personality. Or maybe he is trying to make himself over to appear a gentler, more amiable version of Akhmetov, the billionaire mogul and modern robber baron. There was a smattering of laughs in the press room but I really don't think it went over that well. He's one uptight guy. But I'll lay off the psychological tea leaf reading. Yulia doesn't look happy and I guess she isn't too much. She was on TV last night talking about falsification. I don't know how making that case serves helps her--she benefitted from the vote more than anybody but PR-- but making it does keep her in the public eye and on TV. Looks like she is trying to keep up some sort of public drumbeat to make her PM bid inevitable. That is the only control she has over things, except to maybe make her case in private. But she doesn't have access to Yuschenko so she can't do that. NSNU did very badly. They ended up with less than 14%, worse than the exit polls had it (which, by the way proved more accurate than I gave them credit for. Maybe now I'll have to say "notoriously accurate.") Any consequences that might come from a delay in forming a coalition couldn't be worse than the trouncing they were given on Sunday. Maybe that will factor into their coalition decision. "What could be worse than what we have already suffered?" some might be lead to think. I don't know if it was an article LEvko posted about or not but I read that NSNU will split if it joins with Yulia. We might do well to not underestimate the bad blood that exists personally between people in the two parties. And, though Yuschenko has born the brunt of criticism for not reaching out to Yulia, she herself might have rounded the edges a bit more to make the way smoother for herself in a future PM bid just as a matter of self-interest. But she hasnt done this. The probme is that I think no one thought, including her, that she would be in this position. She does look a bit worn in her TV appearances, though. She did say too that her name was linked with re-privatization as an attempt to discredit her and that that was not her position at all. I don't know who will believe that because she was the one agitating for it before. (That 3000 figure came from her.) And I think you will find that her supporters believe she believed that it was the right thing to do because they believe it. But if she now renounces re-privatization, how will that square with giving the people justice? She does though have some time before the next election and memories may fade by then. But I still think she will have as much trouble with her base as she will have with NSNU or with PR. Between a rock and a hard place..
Yuliya is trying to make herself more attractive to the business wing of NSNU - promising a business-friendly agenda if she succeeds in forming a ruling coalition with NSNU and the Socialists. Kirstin Zimmer, a top-class specialist in East Ukrainian affairs, says in a 'Deutsche Welle' interview that Akhmetov's sudden interest in politics is primarily driven by self-interest and obtaining immunity from criminal prosecution, and that PR does not find being in some kind of constructive opposition "to its taste at all." "Their position is - either in power, or with no-one. [In opposition] they have nothing to say and can only lose," according to Zimmer. She thinks that at the moment there is little chance of Yanukovych leading a future government, but if the Orange blocs cannot overcome their mutual problems and come together, then an 'orange-blue' coalition is possible. He considers the main task of a PR-led government would be to increase economic growth by 8 - 12% p.a. Deep thoughts continued as he went on: "The state is not an effective owner, whereas a private owner is effective." A RU-led government would hold a referendum on the question of Ukraine joining NATO. He promised that he would certainly learn Ukrainian, and would regularly attend parliament. He pressed all the right buttons about transparent business, and declared that he intends to hold on to all of his business empire [which provides about 10% of Ukraine's GDP] and not sell up. I'm not sure whether all this made him and RU look more attractive to his prospective parliamentary partners. NSNU and Yuschenko are between a rock and a hard place. By delaying any decision on formation of any coalition until 7th April they are giving a clear signal that NSNU-PR coalition is a possibility. I guess that it must be sinking in, whoever they work with, they will be junior partner, hence the dithering. The Donbass region, where PR completely dominates at all levels of government, is Ukraine's industrial heartland on which a large portion of Ukraine's economic growth will depend. If PR are not given a 'piece of the action' in parliament, then they will 'scuttle off back to their tent,' and wait until the next elections. One observer puts it thus: 'If NSNU go with BYuT, its nothing but problems. If they go with PR at least some of them will be solved." p.s. Roman Kupchinsky is quite right in his piece in Kyiv Post Ukraine sometimes does resemble a playground for oligarchs. p.p.s. Final election results are just in: PR 32.12%, BYuT 22.27%, NSNU 13.94%, Socialists 5.67%, Communists 3.66% NSNU's result is terrible. Communists who have always figured strongly in the past have almost been wiped out..their days are numbered. He calls himself orthodox which usually refers to the Orthodox Church but he referred the other day to his affiliation with a church called the Ambassadors of God. I don't know anything about that but he credits it with making him a new man. Not to take anything from that, but maybe the old man might have some relevancy here. He says that God elected him but in the sense of a blessing not in the sense of any kind of divine mandate. "Did you think I would be elected? I didn't think so. But God did it." (paraphrase) I am quite sympathetic to that myself. He is president of Praveks Bank. I don't know much about that bank but most of them started out as treasuries for big businesses. About that one, though, I don't know anything at all. He has pledged to help anyone needing it. That sounds nice and as it should be. We'll see what it means. He doesn't come off all that well in public. As a matter of fact, he comes of not so good at all. When he had a press conference the other day, he kept fumbling for words and aides would feed them to him off camera. Don't know what that is all about. But other times he just comes across as someone hiding something or just plain shifty. Maybe he just has a bad TV presence. I guess we'll find out. He complained that Yuschenko hasn't called him to congratulate him. "Even though he was behind Omelchenko, he could have at least called." Could have been a personal appeal. But that was when there were still votes to be counted and it made him sound a bit Alexander Hagueish. He needs to check in with his advisors, I think, before he speaks. But bank heads are rich men here and they usually don't have to bow to anyone so that might be a tough one for him. But then again, he may be just the man he says he is. We'll see. By the way, by saying I thought a deal between Our Ukraine and Party of the regions would end Yuschenko and Our Ukraine, I didn't mean to suggest that it wouldn't happen. That it might not be in Yuschenko's or Our Ukraine's long-term interests is no way guarantees that it won't happen. It just might. They might damn the consequences and go ahead with it anyway. Push the button and see which buildings come down. (Or light the match and watch the firetrucks show up, whichever you prefer.) And they might just say that any improvement in the economy or in the country that might come from it would make people forget. The irony is that a PR-NSNU coalition would be a lot more stable coalition. My problem with it is that I don't see that anything would change with that. The Donetsk clans would have access to the central power again and would do what they have done in the past. That Akhmetov might be interested in turning westward to be considered credible for business reasons doesn't sway me much at all. That is the "it's not in his self-interest argument" that is used an awful lot to predict what people will do or won't do. The question really should be, as I have said before, what Akhmetov sees as his interests not what I determine those interests to be. That is the real issue and it is a subjective issue. Tymoshenko was just on the TV saying that if there is a deal between NSNU and PR, she will be in the opposition, 100% guaranteed. That isn't surprising. The problem with a coalition between her and NSNU is that it will be highly unstable for the reasons I posted yesterday. But there is a real problem out there that Yuschenko and company haven't really addressed all that well and that Tymoshenko may not be positioned to address all that well. It is how they legitimize the people's of the east. They are citizen's too and their votes need to be respected in some way. By rejecting PR, you reject those Ukrainian citizens who voted for it. It also looks like a rejection of the east. That is not a good idea. They must have a stake in the government too. It would be a good idea--it has always been a good idea--to bring them in in some way. But this all is what makes Ukrainian politics so interesting as LEvko said in an email to me today. And that is the absolute truth. LEvko raises a point about Vitrenko. She has been spitting acid for a couple of days about the election. She says there was voter fraud and is prone to using the words "American" and "fascist" in the same sentence when she speaks. I think she means that the Americans worked their magic on this election too and that that was why Party of the Regions won. (There would seem to be a non sequitur in there somewhere.) The fascist part I think she just throws in to inject some humor into the proceedings. She has threatened to set up a tent city. Will she be able to count on her 2.85% to join her? The head of the election commission, Davidovitch, says that she, Vitrenko, and the other complainants, Viche being one of the majors though we hear Pora has joined the chorus today, can set up her tents; he sees no problem with that. It is now warmer and they should be more comfortable in them. And if they want to examine the relevant documents he will be happy to make them available to them. This guy is honest. The elections yesterday will be one of the legacies of Yuschenko. That his party could lose and did lose says it all. Leaders laying out bargaining positions..
Party of Regions head Viktor Yanukovych has stated that he agrees with the President that the parliamentary elections took place in a democratic and transparent manner. Both said there had been some organizational shortcomings which prevented some citizens from voting', but, that "after the final results are announced discussions should start on how to create a parliamentary coalition." PR's campaign chief Boris Kolesnikov added some detail and announced that their conditions for entering any coalition are:  Russian language to be officially approved as being Ukraine's second State language;  Rejection of Ukraine's entry into NATO. Foreign Minister Borys Tarasiuk says in order for talks to take place between his Nasha Ukraina bloc  PR must reject any ideas about federalization of Ukraine,  reject the notion of Russian being provided the status of Ukrainian state language, and  accept a Euro-integrational path for Ukraine. So, quite a chasm to bridge between PR and NU, but I suspect, not unbridgeable if some compromise can be made on the language issue and on NATO. Possible 'king-maker' Socialist leader Oleksandr Moroz has clarified his position too. He is 'for an orange government, but PR must be represented in its structure.' He suggests that in the 4 or 5 oblasts where PR dominate, governors [who have significant power and are nominated by the President] should be of a blue and white hue. With 95% of votes counted its still not clear whether the radically pro-Russian and and virulently anti-west Nataliya Vitrenko bloc will clear the 3% shut-out level. The 13+ votes which would be added to RU's in the event that she should succeed may be very significant in any final tally. Fingers crossed that this Stalinist relic is finally out of Ukrainian politics. [who is Mark 2?] It seems BYuT and the Socialists want to close the deal promptly. The electorate probably want this too. With 97% of votes counted its looking like about a 40 seat majority for oranges if a coalition is formed. Why is Yuschenko holding back? Is it something to do with shady deals I mentioned yesterday? Evening update: With 99% of the ballots counted, [by my wobbly math] I think there would be about a 36 seat majority for an orange coalition. More good analysis LEvko. Tymoshenko's been going around all day as if it's a sure thing and it still might happen. I think a coalition with PR would mean the end of Yuschenko and Our Ukraine. The result might have been different if they had communicated better with the people but they haven't. And that is their biggest failing. They did better the last couple of weeks but what would it have been like if they had done it week in and week out for past year and some odd months? The other problem is that Tymoshenko is boxed in with her own people. They want justice and she has promised it to them. That was what the vote was about yesterday. And that means increasing pensions and government salaries without corresponding increases in production (budget buster), prosecuting the criminals Kuchma and others (expends political capital on a small issue relatively speaking), price controls to put the stop to rising prices (got gas? ), government investments in production and agriculture (can we say shortages? ), and the everpresent turning worm that is re-privatization (where to begin.) If she compromises on some of these, she can kiss a number of her supporters goodbye. She will then find out what it is like to be a pragmatic politician. Yuschenko tried it and got trounced yesterday. There were two real surprises yesterday, at least from where I sit. One of them was that Pora didn't do all that well. It got less than the 3% needed and so won't be in Parliament. That means they're out and have to weather the next 5 years in exile before they can try again. Their problem was that they didn't capture the protest vote which I think naturally should have gone more to them. They could have made an effective argument that they were the real heirs of the Maidan and the OR but they didn't. Maybe they didn't want to be considered opposing Yuschenko and that's why. But the upshot is that they are out. The consolation prize is that it looks like he will come in second in the mayor's race. The other surprise was Lytvyn. He had as much advertising out there as any of them. And he supported about 7 mini circuses around town. I would say he spent about as much as the bigger boys and came up short, under the 3%. So he won't be there either. His theme was bringing all parties together. That might have worked in another year but not this year. It looks like protest was the theme. In a way, it's a pity because he was instrumental in the OR. But recently he seemed to be as much a politico as some of the worst. So he's out and Pora is out. What to do in the wilderness? The President's official website announces that Yushchenko will be meeting the leaders of the the electoral blocs and parties for consultations today , in particular PR, BYuT, NSNU, and Socialists. As far as I can see, political experts, of which there are no shortage in Ukraine, and with about 70% of the vote counted, are tending to predict a PR-NSNU coalition rather than a BYuT-NSNU coalition. Yesterday one of Tymoshenko's closest aides, Mykola Tomenko, at a press conference probably best described what is going on. He said that NSNU's top people had had a meeting to decide what to do in light of the likely outcome of the elections. "The so-called business portion of the party wants to conduct wide discussions about a coalition with PR, but the political portion insists that previous agreements on forming an orange coalition are executed." If a PR-NSNU coalition is established, BYuT will go into opposition. "Let the blue-white millionaires govern [the country]," he added. My guess is that there will be a lot of shady deals being negotiated for a while between the oligarchs who funded each party or bloc, including BYuT, on how any proposed future government programs affect their businesses. This could take many days or even weeks. These guys have spent, incredibly, almost $1Bn on their election campaigns. About a 1/4 of this has gone into advertizing, 1/4 to pay agitators and political workers in their tents, and over $100m for paying political headquarters staff. This, no doubt, will be a boost to the Ukrainian economy, but the people who put up the money will be expecting a pay-off. BYuT's financial sponsors I imagine, would be reluctant for their chosen party to go into opposition too, so they will be pressurizing Tymoshenko not to demand too forcefully the PM position from which she was sacked by Yuschenko last September, but possibly accept the 'consolation prize' of Parliamentary speaker. Tymoshenko leading a newly elected cabinet would be just too much of a humiliation for the President to bear - this is probably the biggest stumbling block to formation of a BYuT-NSNU coalition, even though BYuT would be the senior partner and should be 'calling the shots'. The problem is that throughout the campaign Tymoshenko's unambiguous message was: 'Vote for BYuT, and if we become the largest orange party, I will be PM; vote for anybody else, and you can't be sure who you will get.' So not much 'wiggle-room' there either. Monday midday in Kyiv - 20% of votes counted. Observers are surprised is how well BYuT are doing- Nasha Ukraina and the President in particular seem to be disorientated as the results come in. Yushchenko has entrusted to Yekhanurov the formation of a coalition - the man who during the campaign said he wouldn't work 'under any conditions' with Tymoshenko . It looks as if Yushchenko is finding difficult to accept that Yuliya T, 'the people's choice' for PM who he sacked last September and who he accused of 'discrediting the orange forces' may well be back again running the cabinet. Whether this will improve economic growth and prosperity of Ukrainians it questionable, as Scott quite rightly suggests in his posting. But she has truly 'worked her socks off' campaigning, and will reap the reward. RU's campaign has been quite impressive too - their campaign managers probably doing as well as they could with the material they have. But NSNU' s campaign has been unfocussed, and has lacked leadership - we now are seeing the result. BYuT [unlike NSNU] made a real effort to garner votes in the east of the country, and is paying off for them. They are now claiming that a lot of their votes are being stolen in the Donetsk oblast. As Abdymok quite correctly notes, many reporters, by suggesting that Ukraine is turning its back against the Orange Revolution, are not interpreting the election results quite corrrectly. An article in the British 'Independent' is typical. 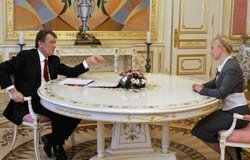 In the repeated second round of the last Presidential elections held on 26th December 2004, presidential candidate Viktor Yanukovych, broadly speaking representing the eastward-orientated portion of Ukraine, obtained 44% of the vote. Yushchenko, leading the westward-orientated Orange forces, and constantly supported by Yuliya Tymoshenko, obtained 52% of votes cast. Now according to a poll of exit polls, of yesterday's Parliamentary elections, Viktor Yanukovych and other eastward-orientated parties will obtain about 35% of the vote, while Our Ukraine, the Yulia Tymoshenko bloc and other Orange parties will obtain about 45% of votes cast. The rift between Our Ukraine and the Tymoshenko bloc may be deep and Yushchenko's popularity in decline, but the 'European magnet' seems to be attracting an increasing number of the Ukrainian electorate. A case can be made that the continued polarization of the country is not healthy and that President Yushchenko should make an effort to remedy this when entering into talks about parliamentary coalitions, but this does not mean that the ideals of the Maidan are fading in any way. The exit polls gave Yanukovich's Regions Party 27-31 percent, the Yulia Tymoshenko Bloc 22-24 percent and President Viktor Yushchenko's Our Ukraine party about 15 percent. Preliminary results were not expected for two to three days. This article suggests that Yulia will be PM. Vox populi, vox dei. Let me just say that foreign investment in Russia was over $200 billion last year and incomes there are twice to three times and more what they are here. Foreign investment in Ukraine was at a record approaching $8 billion, but that record number comes from just two sales, Kryvorizhstal and Bank Avaal. But that is 4% of the investment Russia got last year. I have said this here many times: If Ukraine is going to reach the economic potential which is hers by right, there is a need for foreign investment and lots of it. I will tell you that Tymoshenko does not instill the confidence in investors needed to attract that investment. In fact, they would probably have more confidence in a Party of the Regions PM. But then, capital isn't moral. So now what do we get? Increases in pensions and salaries of government workers? (Not a bad thing in and of itself, but what if there is no increase in production?) Orders to regional governors to bring in meat--chicken and pork-- at projected prices or government stepping in to buy it and sell it from state stores? Re-privatization of how many businesses? Price controls on things like sugar, pork, gasoline and natural gas? Government investment in petroleum refining facilities? (More government employees with more salaries to raise and more government bureacracy. Can we say drinks for drunks? And how are they going to pay for it?) A wholesale undercutting of legitimate businesses, businesses that employ people, with charges of price gouging? That kind of climate will be business-friendly? Is that what we are in store for? What will be the result? Inflation and shortages. Except this time around, Yuschenko will be far enough from the scene to not be blamable for it. (Maybe the Russians?) There may be some vindication in that somewhere. In other words, this time, when Tymoshenko sneezes, maybe she will have caught the cold. LEvko posted last night that the electioneering is over. There is a law on the books that all campaigning for office must cease at a certain time before the election. I'm not sure what that period is but what it meant was that it was over last night. There were rallies and concerts around Ukraine last night in teh final push. The one in Maidan was put on by Poplovski, I think that's his name. (I talked about him in my last post.) He is a minor figure and mostly promoter but he had as many for his get out the vote concert as Yulia did for hers last week. Maybe the entertainment was better, I don't know. And there was a concert in Donetsk last night. Yanukovych spoke by hookup from Kiev where he is now. He rallied the troops who are preparing for victory and they responded. Blood is on the water and they can smell it. Its color is orange. But what that victory might mean is anybody's guess right now. Akhmetov spoke there too. He's a youthful looking 40 year old. There are those who say he is one with whom a constructive alliance might be made because he is concerned with being accepted in the West. (He has businesses, he needs those businesses to be respectable for them to grow, etc.) Its the basic argument of self interest that is so compelling to Westerners but which doesn't compute all that well here. So it is amusing when it is used as a law of nature to predict what a person will do and to bank him in to a certain way of acting. But it ain't a law of nature and Akhmetov's sees his interests as what really? Anyway, they are taking down the posters on the walls and packing away the literature. The only thing left is for the, you know, fat lady to hit it. That comes tomorrow. Excellent analysis from RFE/RL on why this time the Kremlin kept its nose out out of Ukraine's parliamentary election campaign here. p.s. The head of the Donetsk NSNU, Anton Klimenko had a face-to-face meeting recently with Donetsk Regional Council supremo Boris Kolesnikov, according to the Novosti, Donbass internet site. The meeting with Kolesnikov, who is #10 on the PR election list, was apparently arranged to come to an agreement on how the election is to proceed in the oblast. The article quotes a source saying, "Kolesnikov promised to give NSNU 5% of the votes across the Donetsk oblast." Each side had recently accused the other of planning to cheat the elections. The Yanukovych, Kolesnikov, Akhmetov triumvirate are widely considered to be the undisputed rulers of the Donbas region. The meeting was probably just a reminder as to who really runs this neck of the woods. That's it then. Campaigning for Sunday's VR elections ends tonight. There's a short BBC interview with Yanukovych here. Ostrov reports that an NSNU candidate in the Artyemovsk [Donetsk Oblast] city council elections, Hanna Borishpol, was found dead with four stab wounds in her apartment today . The killing is apparently 'not politically motivated'. Last Monday, Gennadiy Korban, an important Dnipropetrovsk businessman and close associate of banking and industry magnate Igor Kolomyskyi, survived an assassination attempt when his S-class Merc was badly shot up. The shots may have come from the car park roof of an SBU clinic. Kolomoyskyi is one of Ukraine's richest oligarchs - the Polish 'Wprost' magazine claim he's worth $2.8Bn, i.e. even more that Akhmetov. Korban is standing as #2 NSNU candidate in the Dnipropetrovsk regional council elections. There's speculation that it may have even been an attempted 'hit' against Kolomoyskyi himself. Boxers, pop stars, judges and wanted men -- an eclectic cast of candidates is aiming to get into Ukraine's parliament in Sunday's election. The whole article is interesting. One guy in particular is the owner of a school for media professionals. It trains models, singers, cameramen, announcers, etc. It used to be a government school but by the special kind of magic available here it became, presto chango, a private school owned by this guy. He comes off on TV as a flimflam man. I hear he is in the Rada now and is just looking to keep his seat. Maybe keeping that seat is his way of keeping the school. Or maybe it keeps the students rolling in, students he uses by the way to perform in his TV variety shows. They get school credit for it, I think. Very good of him don't you think? But this is the disgusting mess that is the Ukrainian Parliament. I say disgusting because there appear to be only a few in it for the people and for the country. Striking it rich or keeping the money flowing appear to be the number one concern for some of them. And it doesn't look like it will get any better anytime soon. Reconstituted Orange, or biggest come-back since Lazarus? With two days to go there is no let-up in mutual recriminations between the two biggest former orange partners. Today BYuT's election campaign chief, former head of the SBU [security services], and part-time baptist minister Oleksandr Turchinov, sensationally accused NSNU of preparing to fiddle Sunday's election results using an intermediate 'transit server' - a technique used by Kuchma's cronies in the Electoral commission headquarters during the 2004 Presidential elections. And in an extensive newpaper interview today when asked if he saw any possibility of Tymoshenko becoming PM again, President Yushchenko replied, " To be frank, it's not very pleasant for me to comment on this question.." When answering another question, he assertively declared: "I know for sure who will not be PM.."
So its looking as if the latter coalition possibility is becoming more likely. Many commentators, including Radio Free Europe/Radio Liberty envisage it will provide: "A much more stable scenario..." They go on to say: "A cabinet supported by Our Ukraine and the Party of Regions would seemingly enjoy the safety net of parliamentary backing...Since Our Ukraine and the Party of Regions are essentially run by oligarchs representing the interests of big business in Ukraine, there would be few obstacles to them agreeing on a basic set of economic, financial, or social reforms. However, such a coalition might encounter difficulties defining Ukraine's foreign-policy priorities and goals. The parties "traditionally" have opposite geopolitical agendas, largely due to the fact that the Party of Regions' electorate is primarily located in Russia-leaning eastern Ukraine, while that of Our Ukraine is principally based in the west of the country, which has closer affinities to Western Europe." Other commentators consider a PR-NSNU coalition on the cards too - they detect that PR are not putting as much emphasis on closer ties with Russia. In an interesting piece in the BYuT-leaning 'Obozrevatel' its writer claims that after the Orange Revolution debacle, for a while, 'all doors were closed for Viktor and Rinat' [at the Kremlin]. Tellingly, PR chose a team lead by the 'US Republican campaign virtuoso' Paul Manafort, rather than haughty Kremlin political technologists, to mastermind their election campaign. PR's comments on NATO, WTO, and other acronym outfits have been relatively muted as the campaign has developed, and there has also been an alleged secret meeting between highly placed US officials and the top PR people, including Yanukovych. Apparently then, the PR-NSNU union has been blessed from 'on high'. When the Russians got to know about this meeting, "The stars on [top of] the Kremlin almost fell off," according to an 'Oboz' source. ps Today's 'Kommersant' runs a story that Ruslan SALIS GmbH - a Russian/Ukrainian JV, has won a NATO tender for Antonov cargo aircraft. No sense in politics getting in the way of business is there.. The article which LEvko linked to is a good one and highlights one of the major problems that the government and Our Ukraine has had: There have been virtually no efforts at all to court the people in the east. I think Yuschenko's pact with Yanukovych was some kind of recognition of this and might have set the stage for something better (and Yuschenko might not have taken such a hit with it if he had made the case for the east then better than he did.) This is all after Yuschenko's OR performance where he was close to perfect in talking about the east and the people of the east. After that though there was silence. I wonder why? This is true still today. RosUkrenergo is a company set up to siphon off profits from the gas industry. There is no disputing that. But it also provides some sort of confidence to the principals involved, that something will be done when the parties say it will be. These companies have people who are linked to other people who give each other confidence that they will do what they say they will do. Of course the fee for this is exorbitant and not the result of any kind of arms length negotiations which is a problem. But this is the way business has been done here and there has been a reason for this in the relative powerlessness of government to guarantee the rules of the game. Things can be done differently and should be done differently and no end of problems occur with the way things are set up in business. We have discussed some here at length. And it is getting better. But these people provided stability when it there was none and maybe, at least as a way of appealing to the east, there ought to be some acknowledgement of that. It may take some holding of the nose to do it but it might be a good thing to do. What is the Smell of Capitalism in Donbass? It seems to me that there are two particularly relevant questions that Orange sympathizers need to answer. First, if you don’t like what has emerged in the Donbas in recent years what exactly was the alternative? Second, how do you explain the very real economic and social gains that have been made in the Donbas in the last few years?" Is it just me or is Lukashenko going for the Hitler look? He's got an Adolph thing going on on his upper lip. Or maybe he's just nostalgic for Charlie Chaplin. I wonder if he has a bunker? I wonder if he's ever going to need it. Party of Regions' Chances Fading? This article suggest no coalition deal will be possible between Our Ukraine and Party of the Regions. Neither Our Ukraine nor Tymoshenko's party will do it, it says. And in an unusually strong statement, President Viktor Yushchenko's party, Our Ukraine, also ruled out any coalition, saying restoring the Orange Team was still its goal. There hasn't been a strong statement from Our Ukraine on much of anything in the campaign. The hard hitting piece on criminals in Party of the Regions was tough but that has been about it. It is hard to say what this means if they are both saying what they mean. ("Still its goal" leaves some wiggle room, no?) Maybe a Parliament dismissal is in the offing? NSNU campaign chief Bezsmertnyi asserts that the only alternative to an orange coalition is the dismissal of parliament by the President, and reveals an orange coalition will be created as soon as polling stations close on polling day next Sunday; whilst Zvarych mumbles an NSNU-RU coalition is not possible due to ideological and political differences. As for Yanukovych, during a visit to the Aviant aircraft factory in Kyiv today, when asked about the possibility of forming a coalition, he struck a statesmanlike pose and sensibly replied, "We have not and will not conduct discussions on principle, because we decided [to discuss this] only after the elections, once we see how many seats everyone has got in parliament." His statement may be interpreted he considers an outright PR victory unlikely, so his later threat of a blue and white maidan in the event of falsification is rather implausible as everyone knows this VR election, unlike the 2004 Presidential election, is not a winner-take-all scenario. The result will be a muddle - not clear-cut; and anyhow Kyiv is predominantly pro-orange. Elections are supposed to be about parties' leaders providing electorates with their vision for the future, about aspirations and plans of action if elected. But to me these Ukrainian Parliamentary elections somehow have sham feeling about them. There has been too much talk of coalitions, behind the scenes deals, and of businessmen and commercial client candidates paying millions of dollars for places on election lists of all of the main parties...and so many candidates with very dubious previous histories on the lists, particularly PR's list. Just a couple of examples how the elections may be more about inside deals and business than politics: there has been speculation that veteran Socialist leader Oleksandr Moroz was keen to see his daughter in the VR, but to avoid the accusation of nepotism, he proposed BYuT give her a good place on their election list, and in return the Socialists would place on their list West Ukrainian magnate Petro Dyminskyi, a close associate of Tymoshenko who is disliked by many of her close associates. [In the end the deal did not go through]. There's speculation that Tymoshenko would be prepared to accept the position of Parliamentary speaker in the event of a NSNU - BYuT coalition, if she were allowed to become gas princess again in total command of gas importation. Similarly, conditions on how [and to whom] the important state Ukrtelekom enterprise is to be privatized have featured heavily in NSNU - RU coalition discussions. One observer calls it the 'businessization' of politics - a post-soviet disease of Ukraine's political elite. Well, it was sort of a visit from Yulia. It was at least a visit from someone who works for Yulia. Okay, maybe it was someone who works way down on the front lines as far away as you could get from Yulia, but it has been the only visit by anyone from any political party, so we felt flattered. It was a man and he rang the doorbell. Actually, he pushed it so hard that it stuck and we had to put up with the loud chirping of a bird until we could open the door and get it unstuck. He said he was from Yulia's party and asked if we supported her. My wife said yes and no, a good solid answer in my book. He said something about that, maybe an "uh-huh" or something equally perceptive. Then he left a slick little pamphlet and departed. Kind of nice. It's the personal touch that Yulia's campaign has been much better at than anyone else's. As a matter of fact, they have had the personal touch field all to themselves--no one else has tried it. Or if they have tried it, the personal touch was all but undetectable in anything they did. This has been the only visit we have had from any party. We live out here in the hinterlands of Kiev but still, if Yulia could do it, Our Ukraine could do it too. Vladimir Zhirinovsky and some others were on a show this weekend about Russian-Ukrainian relations. According to the radio, he was rewarded this morning for his efforts with the honor of being blacklisted for a visa to Ukraine--it was that bad. He was with Boris Nemtsov, Gleb Pavlovsky, the Kremlin spin doctor, and a couple of others including a Duma deputy whose name I now can't remember. Nemtsov was more or less fine. Pavlovsky came across as reasonable. The Duma deputy though said at one point, "Russians want to know if you are our friend or our enemy?" It was in the context of a discussion on NATO accession and it was framed as a question but the tone was one of a demand. Zhirinovsky though breathed fire and spit in the faces of a lot of Ukrainians. I wouldn't be surprised if he single-handedly set back Russian-Ukrainian relations for years all by his little lonesome. I think he got all the political parties there to agree with each other on Russia, except for Party of Region. Nemtsov, at one point, said that Zhirinovsky was drunk. He had too much of his own label vodka on the plane over. His point was that Zhirinovsky was more Zhirinovsky than normal that night. He said this with a laugh and thought it a light thing. But I don't think it went over all that well with viewers here. I could be wrong but I don't think so. The question is how many Russians Zhirinovsky speaks for. He's a fringe player in Russia and a hothead but how many people does he really speak for when he talks about Ukraine? That is a question that I think people here will ask. I wonder what the Kremlin thinks about it? Maybe they are emboldened by Yanukovych's comeback to not worry about it. They are once again in the driver's seat, maybe, so who cares? What, then, of events after March 26? Extrapolating from today's dynamics,three scenarios present themselves. The first is a pro-presidential Orange majority in the new Rada consisting of Nasha Ukraina, BYuT, PORA/Reforms and Order, and theKostenko- Pliushch bloc. Since there is a question mark over whether thelatter two will negotiate the 3% threshold into the Rada the hue of thiscoalition might be altered with the addition of the Socialists and, possibly, current Rada chairman Volodymyr Lytvyn's bloc. But, clearly, the viability of any exclusively or predominantly Orange formation will be determined by the nature of the relationship between BYuT and Nasha Ukraina. Given the extent to which their relations have deteriorated, the prospects for the creation of a majority capable of forming a government will depend on one of the Orange groups clearly 'defeating' the other at the polls, with the 'junior' side forced to submit, no matter how reluctantly, to a solution imposed by the electorate. Any Orange coalition is likely to be brittle, and will more often than not resemble a situational one. The spirit of the Majdan is dead. But that does not mean that the Orange family cannot still live under one roof and choose on a selective basis whether to dine and entertain guests together. However, it is increasingly clear that the electorate will have to be the catalyst that brings theOrange forces to their senses. A second scenario involves some sort of Orange coalition with the Party of Regions. To date, such an option appears to exist more in the minds of experts and observers than in the plans of the prospective Orange participants. Moreover, the discussion has focused almost exclusively on the pluses and minuses for the Orange camp without asking how palatable such a move would be for the Party of the Regions. The Party of the Regions is widely expected to secure a plurality in the new Rada but one well short of allowing it to easily put together a majority. Any Orange-Blue coalition would likely involve one, not both, of the Orange blocs for the simple reason that it would be considered only if the differences within the Orange camp were to prove irreconcilable. BYuT has consistently declared the inadmissibility of such an accommodation, preferring even the dismissal of the Rada to this option. This leaves Nasha Ukraina, presumably on the grounds that last year's courtship with the Party of the Regions suggests that anything can happen. (Plus, Nasha Ukraina has still to categorically reject the possibility.) But such a hybrid would be even less stable than the Orange majority cobbled together under the first scenario. Anyone doubting this would do well to recall the fate of last autumn's memorandum of cooperation between Messrs. Yushchenko and Yanukovych and the events that brought about its annulment by the President. Clearly, cooperation in the new Rada between any or all of the Orange forces and theParty of the Regions is possible on an issue-specific basis. However, creating a majority and coalition government consisting of these forces asthe necessary first step for getting to that stage is very difficult toimagine. The Orange Revolution revealed that Ukrainians have largely rejected thevalue-neutral politics that the advocates of an Orange-Blue coalition are asking them to accept. While any formal accommodation would undoubtedly be presented as a grand gesture of reconciliation for the national good, it would actually be nothing less than an unambiguous expression of the participating Orange side's political bankruptcy. It strains credibility, as well as the Majdan's self-imposed code of what constitutes political decency, to believe that President Yushchenko - or even those other significant Majdan actors, the Socialists, who would be critical to the creation of a Regions dominated majority - would sanction the idea of Renat Akhmetov as prime minister. Indeed, that this coalition scenario is even being discussed (and advocated) testifies to possibly the Orange camp's single biggest failure since coming to power: the failure, not least because of the debilitating internal split, to develop a strategy for reaching out to the Yanukovych electorate in a concerted effort to separate it from the "criminal" elite that claims to represent it and to integrate this electorate into a clear vision of Ukraine'sfuture. Calls by leading experts notwithstanding, the possibility of a formal Orange-Blue coalition is likely to be rejected - though later rather than sooner - by all of the Orange forces. Unanimity on this issue, however, should not be confused with a willingness to unite; which brings us to the third scenario. Critics of this scenario argue that too many people will have invested too much money in securing a deputy's mandate for this scenario to transpire. Others point out that the budget simply cannot afford another election. Certainly, the prospect of a presidential 'hangman's noose' could serve to concentrate the Rada's collective mind and might yet place at the head ofthe government a relative outsider as a "technical" prime minister. However, those very real and to date irreconcilable differences discussed above, as well as the ever- lurking law of unintended consequences, create a very powerful dynamic pointing to the new Rada's early dismissal. Moreover, the financial argument seems to imply that a poor country has no choice but to learn to live with an equally 'poor' democracy. and responsibility to then choose a viable Rada. This is good analysis. I think the idea of Akhmetov as PM is a bit too wishful. A lot of it is premised on the assumption that Akhmetov wants to be respectable in the West. "He is doing it with his businesses; he'll do it with the government." Not very convincing to me even if we assume the first part is true. Akhmetov would only be palatable to Our Ukraine as a way to whitewash a deal with Party of the Regions for power. Hard for me to believe that one's going to happen either. The Belarusian authorities barred two Ukrainian television reporters from entering the country on Wednesday further straining relations between Minsk and Kiev ahead of the March 19 presidential election. The move is the latest step in escalating tensions amid concerns over developments in Belarus just as President Alexander Lukashenka has been seeking re-election to the third term in office. I don't know that Channel Five is known for its unbiased coverage. They were the only station that would broadcast anything about the Orange Revolution and Yuschenko early on. It's a Poroshenko concern and he was on the OR side. But I don't' know what a unbiased coverage really is. Lukashenko will say that they are biased against his rule in Belarus and they would have to admit that is true. That would be a bias naturally. But it is the right kind of bias. He just doesn't want anyone around who is not sympathetic filming what will really be going on in Belarus. The radio here is reporting that people don't want to be seen congregating on the streets in Minsk. Might provoke military reprisals. And they cite the law that gives Lukashenko the power to put down uprisings. Does anybody think that the law is what gives him the power to do something like that? He'd do it without any law because he can and because he will stay in power any way he can. A bid to take over the SBU? This is one of the problems with a government that lacks transparency and with courts that are up for sale to the highest bidder--people can't have any confidence in the end that a policy decision isn't some sort of power play. And the opposition can play the ambiguity for all it's worth, which can be a lot here. Vladimir Rogalin, the head of the Procedural and operative department Vladimir Porodko had to resign following the presidential decree. This may be connected with the recent taping scandal, connected to the ex-SBU head Aleksandr Turchinov. Ukrainian Interior Minister wants to take over the SBU Ukrainian Interior Minister Yuri Lutsenko wants to take over Ukrainian Security Service (SBU), local sources report, quoting ex-Finance Minister Sergey Terehin. Answering the questions on the taping case involving ex-SBU head Turchinov, he noted that the latter resigned 7 month ago, but the taping scandal somehow was invented now, before the elections. Lutsenko, to his mind, initiated the scandal to take over this post, as the Ukrainian President Viktor Yushchenko plays to his hands, knowing that Lutsenko will not be supported to take the post of the Interior Minister again, as he made enemies with most of the local politicians. Yushchenko can place him to head the SBU. To remind, AIA already reported that previously Lutsenko demanded to pass under his jurisdiction the control over the investigation of corruption cases on the highest levels of the government, control over the border guard units and subordination of the Emergency Control Ministry of Ukraine. The local experts noted that the next move of Lutsenko will be taking over the Security Service of Ukraine. He already hinted his intentions when recently criticized the SBU for hampering reforms inside its structures. Corruption has always been the problem here. It is an added tax on everything; it deforms policies and politicians; it allows government officials to do pretty much what they want without any threat of reprisal; and it leaves the people without any confidence in government. ANd democracies, in the end, need the confidence of their people to function. This all means that reform, as difficult as that is, has always been the solution. That there hasn't been much of it is a real pity. There is a lot of talk around here about price controls. One of the candidates for mayor of Kiev has made it a central plank of his election campaign. Others have mentioned it too and it came up in the press conference day before yesterday with Yekhanurov. And if people can refuse to sell or sell somewhere else, that means shortages. We already went through this with Tymoshenko's price setting. The price of gas was set and there were shortages. The response was to blame the gouging middlemen, middlemen who created jobs much as they do in any country in the West, and to make plans for the government to step into the market itself to create production at the price it wanted. The whole thing sounded and still sounds all kinds of retrograde. How would government pay for it all especially if foreign investment passed over Ukraine much as it has done? I guess you could always impress workers to build what you want. That has been a good source of cheap labor before, so at least there is a history behind that. It's a disreputable history but it is a history. But if you don't do something of that sort, how are you going to pay for it? The people who argue for price controls say nothing about this. They are either ignorant about the effects, which isn't a good sign, or they are pandering to the public, which also isn't a good sign. That people are hard hit is true. How you deal with that without making things worse is the problem. And price controls will simply make things worse. In the press conference mentioned by Scott, Pres Yushchenko, when asked about a possible coalition between PR and NSNU in the new parliament, replied: "I'll will be able to give you a reply to this question in 31 days" [i.e. a few days after the elections]. Yushchenko also blamed Tymoshenko for 'discrediting the Orange forces' but didn't want his statements to be considered as electioneering rhetoric. Yesterday Yuriy Yekhnanurov, when asked about coalitions, said: "Lytvyn bloc - yes, BYuT - yes, [Party of] Regions - no." On the same topic BYuT parliamentary fraction leader Anatoliy Semynoha declared that his party is ready to form a coalition with NSNU and Moroz's Socialists, "[but] only in the event that they [ie BYuT] receive a larger number of votes" in the election on 26th March. He suggested that if a majority of electors support NSNU or other party, then NSNU will not form a coalition with BYuT. "This will be a coalition with Yanukovych...whose main aim will be preservation of power, and not development of the country." Meanwhile Tymshenko in a <1+1> TV channel appearance on 13th March stated, "[We don't need] compromises with gangs, mafias, and clans, so, who am I to work with - if there is Yanukovych on one side, and Poroshenko on the other? I have only one way out - receive 51% of the vote. Then everything will be OK." She also pointed out to viewers that if they vote for BYuT they will know exactly who the leader is, and if her party gets sufficient votes, who the next PM will be. "People should elect a real person to govern the country, and not 'a cat in a sack' [ie an unknown entity]. [I have written about ambiguous statements made by Yuschenko on this matter previously]. Scott is quite correct - Yekhanurov is an asset that NSNU have not exploited anywhere nearly enough in this election campaign. Their hard-hitting TV prog shows they know where the danger lies, but their leadership have not driven this message home in their personal statements, allowing BYuT to appear more true to the ideals of the Maidan. Yekhanurov must maximize his media profile as current [and NSNU's future] PM in the time left if NSNU are to realize the full potential of their party. Which way is Ukraine going to turn? There were two press conferences today, one from Yekhanurov and one from Yuschenko. My wife watched them both; I didn't have time to. She came away impressed with Yekhanurov. When asked a question, even a provocative question, he would smile and give straighforward answers. One example: A woman said that the government promised to increase pensions but that when it did, the increase was all eaten up in higher prices. What did he have to say about that? Yekhanurov said that she was right but that they government was not going to control prices. He said it will not work. And he is right. Yuschenko came across as he always does. He tended to talk more and not always to the point. Be he came through as decent. He doesn't suffer what he considers to be stupid questions all that well though. When asked about RosUkrenergo, he responded that the press needed to be intelligent in fulfilling their responsibilities. Translation? Don't be stupid. That kind of response gets him into trouble. In that forum, he doesn't come across as effectively as Yekhanurov does. Pity, pity, pity that Yekhanurov hasn't had more time. One dog asks another dog, "So what is it like living in a democracy?" The other dog, "Well, the food is put further away and the leash is shorter, but they let you bark as much as you want." In a long interview in the periodical 'Biznes' today, Yuliya Tymoshenko admits that some kind of coalition will have to be created in order that a government be formed after the VR elections, and gives a hint of what kind of coalition she would be prepared work with. She again repeats that any possibility of coalition between BYuT and RU is out of the question, but also states, "I am not prepared to work with Roman Bezsmertnyi, nor Petro Poroshenko, nor Mykola Martynenko, nor Davyd Zhvaniya, nor Evhen Chervonenko, nor Alexander Tretyakov [some of NSNU's leading lights]..because these people destroyed the good name of the new authorities." She warns that several of Yushchenko's advisers are talking up the possibility of a RU-NSNU coalition, which, in her opinion, would be, "a full and irreversible return to the old regime." She proceeds to give Yekhanurov a good 'thumping', accusing him of being Kuchma's 'eyes and ears', and of continuing to protect Kuchma's financial interests. Anatoliy Kinakh is not spared either, and is accused of inproprieties surrounding business affairs associated with Boryspil [Kyiv] airport. Yekhanurov's riposte today was that he will not work with Tymoshenko "under any conditions." Not to be outdone NSNU front man Roman Bessmertnyi, has claimed that when BYuT #2 Olexandr Turchynov was Ukrainian Security Service chief in the Tymoshenko government last year he authorized illegal tapping of 'phones of the high ranking officials e.g. the previous head of the National Security and Defense Council Petro Poroshenko, ex-Minister of Justice Roman Zvarich and others. These declarations are merely examples of the mistrust and enmity that exists between NSNU and BYuT leaderships. But as I wrote previously, a BYuT - NSNU coalition is still considered a realistic possiblity. According to NSNU #3 Borys Tarasyuk, "pro-democracy parties are capable of bridging their differences and restoring the Orange coalition." How can they possibly be reconciled? Tymoshenko has given some idea of her opening offer. But I have the impression that most of the Orange leadership would do a deal with the devil to stay in power, just as Yushchenko did when he offered PR his 'Memorandum' to get PM Yekhanurov approved by the VR last September. 2. What is the impact of the civil society institutions having on the elections. The answer to this one is again, I don't know. I haven't seen anything or heard anything about that. There was a lot of activity on the part of various religious denominations, for instance, during the OR. There doesn't seem to be all that much now but that might be because the OR was so public and open. It might still be happening but not in a way that might be reported on or seen. That is it might not be as public as it was. Ukrainian Foreign minster Borys Tarasyuk said in Washington on Friday, " We are confident that the pro-democracy forces will gain a clear majority in the future parliament. Despite the fragmentation between the pro-democracy political parties their combined approval rating has even slightly grown. There should be no doubts that the pro-democracy parties are capable of bridging their differences and restoring the Orange coalition." Yushchenko expressed similar opinions claiming the opposition will obtain no more than 30-35% of the vote. The last OP's before the elections have now been published, they show PRoU leading, with 20 - 33% of the electorate prepared to vote for them. We see Ukraine's smartly attired and manicured policians emerging from expensive automobiles, treading red carpets, waving to crowds... or immaculately coiffured, respectfully being interviewed on TV in glitzy studios....and tend to forget about the disreputable histories that many of them have. I guess we want to believe leaders are all honest and upright. But how many of the 'bandits' have gone to jail? How many will get into Parliament? Why are so many odious characters from the days of Kuchma who feature on Melnychenko's tapes still strutting on the Ukrainian political stage in the main parties? If I was a voter, I would look at the electoral lists, and the go for the one which contained the least number of 'bad eggs'. Not the most satisfactory way of electing a government..
As Scott sggests, the VR election campaign may be coming out of its 'phoney war' stage at last. Roman Bezsmertnyi, campaign front man for NSNU, has publicly launched a 'Register of Falsehoods' that BYuT are apparently [shock-horror!] promulgating about NSNU. [Someone should tell Bezsmertnyi that beards are a no-no for politicians.] Their official website [also in English] shows that attacks on BYuT are being ratcheted up a couple of notches. As a reposte, BYuT #3, Mykola Tomenko, one of the leading field commanders of the Orange Revolution, a young, urbane politician with, by Ukrainian standards, a 'squeaky-clean' reputation, has challenged NSNU #1 and current PM Yekhanurov to a public debate about how Yekhanurov, as State Property Fund chief in the '90's under the disgraced pair of former Pres. Kuchma and former PM Lazarenko, 'privatized' the Ukrainian economy and agriculture. "My knowledge of agriculture will be sufficient to demonstrate that the children and families of leaders of the then party and economy nomenclature acquired everything which our fathers worked for, for next-to-nothing," said Tomenko. Tomenko claims that Yekhanurov hindered reprivatization of Kryvorizhstal during the short time Tymoshenko was PM; and when Yekhanurov became PM following Tymoshenko's sacking, Kuchma, called him, "the best of my pupils," and gave him his public blessing. A few days previously Yekhanurov had praised Tomenko, even mentioning him as a possible Minister of Agriculture in any future coalition. Meanwhile several of the main parties are talking up the possibility of falsifications, perhaps getting their excuses registered before the elections take place, in case they fare badly. "Akhmetov would become the new "Renaissance Man" to lead Ukraine out of chaos and into a progressive future by forming a center-right "Grand Patriotic Coalition" of some 330 members from Regions, Our Ukraine, Tymoshenko’s Fatherland party, and Pora/Reforms & Order, assuming the latter passes the three percent barrier...[Akmetov] is using Euro-U.S. business experts to create models of efficiency and transparency. He is clearly interested in separating his businesses and himself from a controversial past, hoping to take Systems Capital Management, his primary business holding, and other companies, public on the London and New York Stock Exchanges." The question for the Ukrainian electorate is, "Should you vote-in a highly placed political leader with such an uncertain background?" Would any other west European country, which Ukraine aspires to be, do so? By grudgingly accepting the reprivatization of Kryvorizhstal, Akhmetov and Pinchuk may feel that they have repaid any dues to the Ukrainian State Treasury, and their slate is wiped clean. But surely the first time any decision has to be made that threatens their business interests in the new VR, Akmetov and his underlings will put their personal interest first. Other leading parties have links to oligarchic groups too, so unfortunately the same can be said of them. As for the surgical operation to separate the Siamese twins of business and politics in the VR, of which Tymoshenko spoke in her inaugural speech on being appointed PM last year, the hospital has not even received planning permission for its construction. It looks like the gloves may have finally come off. Last night, one of the local channels broadcast a broadside from Our Ukraine directed at Party of the Regions. The gist of the half hour show? That the election roster of Party of the Regions contains people who have a serious criminal past. To readers of this blog, this will not be news. LEvko has been posting about this for weeks. The thing about that program last night was that it was so compelling. It had the style of one of those expose shows in America and it was well done, complete with film footage. I had to keep looking down at the corner to see the Our Ukraine logo to remind me that it was a political commercial. This is welcome to see. To call these guys shady would be understatement in the extreme. Some of them are just bad and they have a real chance to be elected to the country's Parliament. HBO should start another series on the mob when the Sopranos ends. Call it, The Verkhovna Rada. The plodding Ukrainian Parliamentary election campaign may perhaps be enlivened by a series of debates scheduled to take place on Channel 5 TV, but I'm sure they will not resemble in any way the truly memorable, incredibly tense and rivetting Yanukovych-Yushchenko duels during the 2004 Presidential campaign. The debates with be head-to-heads between pairs of parties - with Socialists up against Lytvyn's bloc on 12th March, Communists against BYuT 18th March, and PRU against NSNU, [probably featuring Yanukovych vs Yekhanurov], on the 19th. Whether you love her or hate her Tymoshenko is a class act on TV, and the others do not like being 'handbagged' by her. Much better to have had a three-way debate between the three largest parties. PR, NSNU, and BYuT, who currently lead the ratings. Robotic Yanukovych against the more suave Yekhanurov could be interesting, but with other members' of their respective political parties also taking part, and the possibility of them 'pulling their punches' because of 'under-the-table' coalition deals, may mean that these confrontations may not be the show-downs viewers would like to see. There was an interesting OP conducted in in the easternmost Ukrainian city of Lugansk showing PR at 31%, BYuT 9%, Vitrenko's bloc 8%, Ne Tak 6%, Socialists 5%, Communists 3%, NSNU 3%. PR are not as strong as perhaps would have been expected here. A significant degree of apathy of some of those questioned was also present, so across the country, there is still plenty to play for in this campaign. There has been some talk by commentators of grand coalitions, while others have spoken of a 'technical' cabinet after the elections. 'Technical' is sometimes used by Ukrainian politicians to 'fudge' explanations, [e.g. 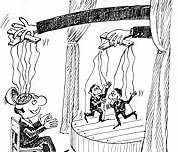 political deals fail to be clinched for 'technical' reasons, or 'disappeared' gas is euphemistically called 'tekhnichniy haz'], so to me 'technical cabinet' has a whiff of informal deals made by oligarchic groups pulling the strings. PR #1 Yanukovych has been described as a 'parovoznik' - just the engine-driver or 'front-man' who will get PR into the VR, and then will be demoted by the oligarchic power-brokers. I have been meaning to comment on what LEvko posted here from a radio address of Yuschenko's. LEvko quotes him as saying categorically that there will be no more privatizations and that he will work to forge a closer relationship between business and government. On the business/government point, it is tempting to make an argument that business and government are too close as it is. One of the rather disgusting things about this Parliamentary election is how many people are on the rolls of the parties who have no experience whatever that would be useful for much of anything in terms of public policy. There are any number of personalities--singers and entertainers are big--on the rolls of the major parties, including Our Ukraine, I might add. They are there probably for the draw of their names but it is hard not to draw the conclusion that it is a good career move. And there are any number of business interests lining up for their shot at a place in the Verkhovna Rada. Why is this? The usual reasons, money and power, or to be more accurate, power equals money. But I think what Yuschenko means, and he means it sincerely, is that government needs to take into account the requirements of business more than it has in the past. And that is what is needed. There are any number of large businesses in Ukraine. They can fend for themselves quite well with their contacts and relationships. It's the small and medium sized business that suffers here. And it is those businesses that will create the jobs that will raise the standard of living of Ukrainians, not the large businesses. In the US, 80% or more of new job creation comes from small to medium sized firms. They need to be cultivated here and, I'm afraid, protected by the government. That Yuschenko says this and keeps saying it is a good thing. There is a need however to get things done to make it happen. The privatization is something that has been known for awhile. That they won't privatize any more is no surprise. The question I have though is why Yuschenko is making these points right now? His party is in the middle of a campaign for the Parliament where they are trailing. An assurance that there will be no new re-privatizations may make investors feel more comfortable but those investors are mostly foregin investors--they won't be voting. It is difficult to see how this will reassure average Ukrainians at all. As a matter of fact, most Ukrainians who participated in the OR want to see some justice meted out for the sins of the oligarchs and they see re-privatization as a way to it. To say there won't be any more may in fact hurt Our Ukraine. And making the case that small to medium sized businesses ought to be cultivated without linking it to people and their lives doesn't help in the election either. In fact, they might see it as a case of just what I posted above-- more of the usual with businesses lining up to carve out for themselves a fat piece of the state hide. So I am at a loss as to why he is making these statements now. Maybe there is some done deal that gives him confidence in some continuity as LEvko has suggested? Or maybe he just has a government to run and this is a matter of course? It's now apparent that any further large-scale re-privatization schemes would scare off desperately needed foreign investments Ukraine. There is a 'third way' possibility of which little has been heard - retrospective 'one-off' windfall taxes to be paid by those who bought former state assets at artificially low prices in rigged tenders. The slate would be wiped clean, and cash recouped for the state coffers. One of the reasons why the lists of all of the leading parties in the Parliamentary elections are so loaded with the oligarchs and magnates who benefitted from 'prykhvatyzatsiya' [which means seizure, but sounds very much like pryvatizatsiya], is that when they take their seats in Parliament they will ensure that any possible laws on reprivatization or retrospective windfall taxes will be strangled at birth. Today is the Day of Women an important holiday holdover from the Soviet days. It is a big holiday though and everyone, or most everyone, has it off including the elevator repairman for our building. Hiking up 13 floors with the littlest Clark in hand is not my idea of the perfect holiday. And on the same theme, we saw the first TV ad for Tymoshenko. It was a nice picture of her holding her check symbol cupped in both hands. We didn't hear the audio portion but the picture was a nice one. It just brings home the fact that her party is all about her. That's all it's got really. Anyway, Happy Day of Women. Love one another, build Ukraine..
During the 15 years of Independence Ukraine's population has declined for various reasons from 52 to 46.9 million. BYuT is proposing women to be paid 8.5 thousand hryven' for giving birth to a first child, 15 thousand for a second, and 25 thousand for a third. [5UAH ~ 1$] This additional state benefit is, no doubt welcome and would probably help increase the pitifully low birth rate. Seriously though, all this is analysed in more detail in a rather depressing article in 'Obkom.' One major cause of the population decline is the increase in premature deaths of Ukrainians, especially males, in the 25-34 and 45-54 age brackets, particularly acute in rural eastern and rural central-western areas, as well as in the more industrialised cities. Western Ukraine has proved more resilient and not suffered to such an extent, despite economic migration of a significant portion of its population. One would imagine that the rural population would be better fed, and better sheltered from industrial pollution, but in fact death rates caused by TB, syphilis, chronic alcoholism, and drug abuse have significantly increased there. "In a changing and uncertain world most decisions are wrong - success comes not from inspired visions of exceptional leaders, or the prescience achieved through sophisticated analysis, but through small-scale experimentation that rapidly imitates success and acknowledges failure - this is the genius of the market economy." It is up to the government in Ukraine to establish a situation where such small-scale experimentation can take place in an unfettered manner, otherwise sad physical and moral decline will continue. You can do it.. The Kremlin is happy these days. Two key former Soviet states - Belarus and Ukraine - head into elections this month amid dramatic accusations of planned coups, state coercion, and vote-fixing. But Moscow isn't worried. But the inability of new leaders to fulfill revolutionary pledges, together with the failure of popular pressure to effect change in other Soviet satellite states, has opened the way for Moscow to reassert its influence in the region. "Those upsurges were the response of people to bad governance and worsening conditions, and the new leaders that came in have shown themselves unable to offer improvements," says Gennady Chuffrin, deputy director of the official Institute of World Economy and International Relations in Moscow. "Ukraine could even see a reversal of what happened a year ago. Obviously the Kremlin would like to see a weakening of [Ukrainian President Viktor] Yushchenko, and I think that's what's going to happen. "Ukraine's economic decline and disillusionment have propelled the pro-Moscow opposition party into first place in opinion surveys for parliamentary elections on March 26. In an ironic twist, the opposition leader Mr. Yanukovych, who was forced out of power after being accused of rigging Ukraine's 2004 presidential election in his favor, claims the authorities are preparing to steal the polls. "The orange team can only remain in power through massive falsifications, and this is what they are doing," he said last week. Hey, guys, they got it this time for a whole lot less than $300 million--like, how about, basically, for free. The fact is that Russian business fared worse under Kuchma/Yanukovych than it has under Yuschenko. But business in Russia has been brought to heel to do the Kremlin's bidding so this is of no concern to them. Power is of interest to them. "Election to be rigged" says the expert. Sweet words butter no parsnips..